I haven't worked with caul fat in a while, but I just couldn't resist when I saw the inventive use for it by Indiana's Smoking Goose Meatery. Caul fat is a spider-web like lining of fat that surrounds the inner organs of pigs. It's like an internal safety net of fat, holding everything together in one big membrane sheet. In the culinary world you use it to wrap terrines, meat loaves, or to make the little sausage bundles called crepinettes in France. But the Smoking Goose uses them to wrap up meat before curing, like sausages in a natural casing. 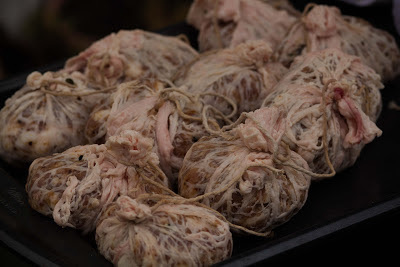 It makes perfect sense, as the caul fat is similar to a sausage casing in composition, just with some larger webs of fat weaving through the surface. 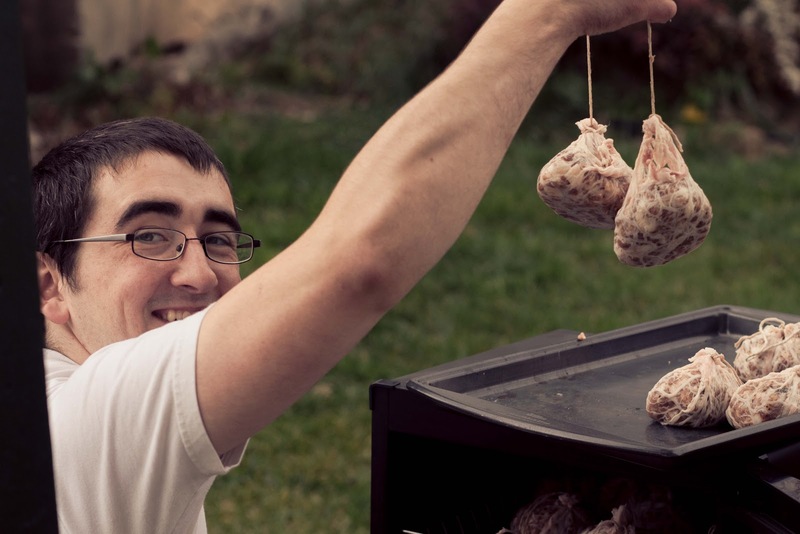 The Smoking Goose makes a very spicy salami with their caul fat, called the Delaware Fireball, similar to a spicy Calabrian salami. I spoke with Josh at the Smoking Goose, who told me caul fat is very easy to work with in curing, just to make sure you treat it like any other casing and pierce it with a needle to rid the salami of any air pockets. So the recipe for my version was similar to the SG salami, although I didn't use a ton of chiles, as Carla's not a huge fan of super spicy foods. Instead I evened out the chiles with garlic and black pepper. To help the sausages cure I mixed in a blend of dextrose sugar and a fermenting bacterial culture. This culture will eat up the sugars and release lactic bacteria that will lower the pH of the meat and make it less susceptible to pathogens. After the forcemeat was wrapped in caul, I tied them up in bundles like beggar's purses and strung them up in pairs with twine. It does give them a bit of a jocular appearance, but I think they'll be great. Then they went into the smoker for several hours. This helped to incubate them, as the warmer temp helps the meat culture work faster and rapidly lower the pH. It also obviously gives the meat a nice smokey flavor, but it does double duty on helping preserve the meat. As the meat is smoked at lower temperatures (90 F), this releases the various flavoring compounds of the wood smoke, along with coating the surface of the sausage in an antimicrobial layer of acetic acid (just like vinegar!) and carbolic acid (which is known as phenol). Again, this works to lower the pH and create a safe, edible product. Lastly, the smoke works as an antioxidant. This probably sounds odd, as we think of antioxidants as things in blueberries and pomegranates, not burning wood. But the smoke helps to prevent the fat in the meat from oxidizing and taking on rancid flavors. A few years ago I had no idea just how complicated smoking meat could be! 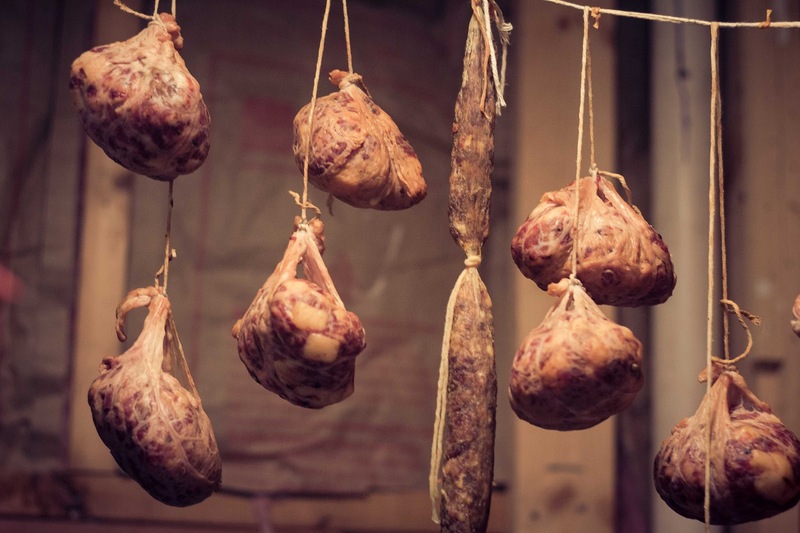 So now these salami are hanging to dry. It should be a few weeks for the small salami to cure, and a few additional weeks on the thicker ones. Hi. So how long did your dry curing take and how was the caul fat as a casing.